If you’ve been searching Atlanta for your favorite shade of OPI nail polish, we just might know where it’s gone off to. In just over a week’s time, works by acclaimed Atlanta-based artist Scott Ingram are set to grace the perfectly manicured walls of Emily Amy Gallery. The gallery’s first-ever exhibition of said artist, entitled Cusp, features drip drawings painted in nail polish in shiny, lacquered shades of metallic, neon and neutral. 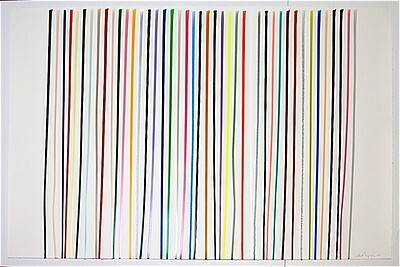 With a strong nod to Abstract Impressionism and channeling the spirit of contemporary artists such as Ellsworth Kelly, Frank Stella and Kenneth Noland, Ingram’s nail polish drawings, generally done on paper or directly on sheet rock walls, are visually arresting testaments to the study of color, line, and the often independent nature of a work of art. First presented by Uri Vaknin in 2001, the exhibition at Emily Amy Gallery marks the first time in six years that the drawings have been on display. 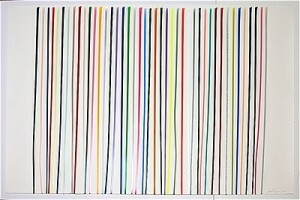 The exhibition will be at Emily Amy Gallery December 9, 2011 – January 28, 2012. An opening reception is set for Friday, December 9 from 7 – 10 pm. Cocktails and hors d’eouvres will be served; nail file and cuticle clipper optional.